Use Code: OUTSTATION Rs. 100 OFF on outstation cab bookings from Jaipur! Book Now!! • Kms will be billed from garage to garage. • This fare does not include inter-state tax, toll and parking. Hippo is providing amazing services. The best thing about team is their commitment. 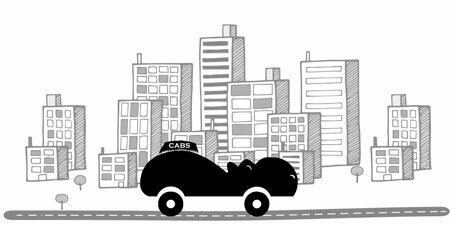 Unlike other cab services, they have not cancel the ride, rather they have provide me a cab which especially came from too far to pick me up because of their commitment. Kudos to team.. Good work. 1st trip with hippo cabs... awesome ride.. Its my 1st trip to jaipur to delhi with hippo cabs... starting, i was thinking its all fake, hidden charges will be applicable... but no hidden charges, comfortable seat, saving of time... its very good for business tours. Excellent highly recommended!!! Excellent one way cab service. Cabs are always spot on time. Have booked in for 3 am couple of times. No issues at all. 24 hours tech support and all of this for such a reasonable price. I would highly recommend it to anyone. Kudos to your hippo team. Hippo super duper cabs Hii this is Atishay Jain,i tried hippo Cabs for my business trip from Jaipur to Delhi and i am 200% satisfied with the service whether it is related to punctuality driver behaviour, neatness, owners gesture etc. You will feel like your own car,the rates are also very reasonable, in short line i must say traveling by car means hippo Cabs. “Chalein Sir?” The driver asked my Grandfather politely. As he instructed the driver to start the car, I already started to regret my decision. The two of us, never spent hours at a stretch talking to each other. My mother warned me about his conservative nature & that I behave myself on the five hour trip. As the driver turned on the ignition, I was thinking of the events that led me to consider a Jaipur to Faridabad private taxi. My parents told me the night before that I was to travel to Faridabad. At first we considered going by air, but it had been long since I took a road trip. I had taken a taxi service from Jaipur to Faridabad airport once when I had to give an exam on a short notice, but that’s another story. My excitement fast turned to annoyance when they told me that my grandfather would be accompanying me. He had to attend a wedding. They said I could use some ‘quality’ time with him. Ten minutes had past and it seemed like an hour had gone by. Suddenly, my Grandfather broke the monotony by asking the driver a few questions like places to visit between Jaipur and Faridabad. After their conversation came to an end, he turned to me and started asking me about my life, this is what I was dreading the most. At first he lectured me about how I should have taken my CPT exams seriously, or maybe studied hard for a government job. This became more irritating when the driver jumped into the conversation, with an expression of excitement saying, “Sir, mere bete ne abhi-abhi CA final clear kiya hain!” I thought to myself, this time the Jaipur to Faridabad car hire wasn’t such a good idea. The expression of pride on my grandfather’s face was like the cab driver’s son was his son. Not knowing how to reply to my grandfather’s statement, the driver just laughed heartily. “Farhan! Are you friends with a Muslim?” Shocked,he asked me. Then began a tirade, against Muslims. “They are not like us! We have nothing in common with them Sahil! Will you ever start thinking properly?” I started to zone out as I realised that saying anything would make things worse. Earlier during the day, my aunt called my mother to tell her that my uncle would pick us up near a pizza shop at the Jaipur to Faridabad airport drop taxi stand. They soon started a conversation about the shopping she did for the wedding. In the course of the conversation, my mother forgot to tell her that we were coming from Jaipur to Faridabad by private taxi. We were entering the city when my mother called to say that we would be picked up at the airport, she sounded guilty. We had to turn around and take the one way taxi from Jaipur to Faridabad airport. On reaching, my grandfather took out his wallet, paid the driver and tried to strike up another conversation but the driver seemed too tired, so he let it be. My uncle greeted us. My grandfather seemed happy, then he turned to me and said “Merko kabhi tum dikhne nahi chahiye uss Muslim Ladke ke saath.” I ignored him. “Mohammed Khan” The driver replied with a poker face. I put all energy into controlling my laughter. My Dadaji just became friends with Mr. Khan a few hours ago. Till today, Farhan continues to be one of my closest friends, my grandfather never saying a thing. “For the love of God baby, please get back in the car!” Shruti shouted, her voice cracking, her beautiful oval eyes pleading for me to get back into the cab. “How many times should I tell you the truth! He-Is-Just-A-Friend!” Tears rolled down her cheeks. I had recently come back to India and we had booked a one way cab from Jaipur to Faridabad airport. I heard about policemen ill-treating civilians here. So even though I behaved ignorant, the driver’s words made sense, I got into the car. I banged the cab door. Shruti covered her face with her hands, crying. Still not able to absorb what had transpired an hour ago. Back to my homeland after 4 years, I was here to marry my childhood sweetheart Shruti. It burned me to discover that she was cheating on me. His name was Akshay. Akshay’s face looked like he was punched in the nose once and the bruise never wore off. I stalked him on Facebook and figured he didn’t look like her type. I couldn’t wait to meet and punch him again in person. Shruti kept weeping. I did not know what to do. A part of me wanted to just leave her to herself, the other wanted to hug her tight and tell her it will be all right. But was it? Could I forgive her? I turned and looked straight at Shruti. “Okay, you say you haven’t cheated. Then why would you send him a message saying I love you?” I asked. “So what is this?” I questioned her, shoving the phone in her face. “How long before this Jaipur Faridabad taxi came to a halt?” I asked the driver. He said it will take a couple of hours. “Just 2 more hours’ baby, then we are done. You won’t have to see my ugly face again, you can marry your ‘just-friend’ Akshay” I mocked. “But..But…I did not even…he is not even…” Her lies had turned to mush. I warned Shruti to stay quiet & answered the phone. “Aur behen kaisi hain, Have you picked up Sahil, baat toh kara uss hottie se”. ‘Hottie? He really is a douchebag’ I thought to myself. I hung up. I was processing what just happened. Akshay liked men. I jumped to conclusions, for no reason. But there was one thing I couldn’t understand. The journey seemed long now. She told the driver to stop at Faridabad’s bus station. It’s been 10 years since we covered that distance between Jaipur & Faridabad. A lot has happened since. I remember apologizing a thousand times, but ‘no’ was all she said. Shruti I hear is married now, I do not know the details. I am married and have come a long way in my career since. The taxi fare from Jaipur to Faridabad airport cost me more than just my money. If only I did not doubt her, things would be different. ‘This is way better than I imagined’ Aarushi thought. She is taking a taxi service Jaipur airport to Faridabad. She lives close to the airport with her mother and father, who are out for work most days of the month. The driver Ajeet is polite and her mother Gayatri is not in her usual nagging mood. Ajeet is enjoying the drive, the cab is gliding down the highway and the weather is perfect for a hot cup of tea. While Aarushi and Gayatri look out the windows on either side, Ajeet is happy to get time away from his annoying teenage daughter. The cab’s AC is at its coolest. Tiny droplets of sweat run down Gayatri’s large forehead. She’s constantly looking at her watch for the time. ‘There are still a couple of hours left before we reach Faridabad’ Gayatri finally speaks. She can’t figure how to bring up the topic she wants to talk about. She begins by signaling Aarushi to take off her earphones. “Yes mother?” asks Aarushi, looking into Gayatri’s eyes with a cold stare. Aarushi is red with anger. She thought to herself, taking a taxi for Jaipur airport to Faridabad would have been less traumatic. This inquisitive nature is what Aarushi doesn’t like one bit. She doesn’t like being treated like a child at the age of 24. She is not in thistaxi to have her mother nag her all the way. “Why should I tell you?” Aarushi burst out at Gayatri. Gayatri turns to reach her brown leather purse. She opens the zipper, takes out a plastic bag and waves it at Aarushi’s face. “Because I found this in your laptop bag.” It’s a pouch filled with low-quality marijuana. There is a sign of embarrassment on Aarushi’s face. She is shocked. She knows her mother is relatively open-minded. But knowing this could be the end of their relationship. Aarushi is dumbfounded; she doesn’t know how to respond. Gayatri is angry. Even the driver Ajeet can feel the tension in the Hippocab. He wishes to stop the cab and take break. He focuses on the road instead. “Bhaiya! Cab Roko! Please!” Aarushi suddenly shouts from behind. The sweat which was on Gayatri’s face is now on Aarushi’s. As soon as Ajeet stops the cab, Aarushi runs to a bench near the Faridabad-Jaipur highway. She takes out her breather and starts puffing. Gayatri follows her. “How long?” She asks. “You won’t understand, besides you don’t even care!” Aarushi runs back and takes her place in the passenger seat. Gayatri sits in the backseat. “Make me understand, and don’ttell me it helps you relax. You have had asthma ever since you were 12.” Gayatri’s words sound more like threats. Seeing the two get back into the cab, Ajeet stubs the cigarette he lit and gets back to his seat. “Chalein Madam?” Drop-dead silence is all he gets in response. Taking it as a sign of approval, he starts the car. Aarushi reaches out to plug in her music. “Don’t you dare try to avoid this topic? You better reply now or I will ask Ajeet to turn the cab around and take us back to Jaipur.” Gayatri’s threats are more direct now. “Oh Come on! Like you would ever do that. Don’t you remember mom? It was you who wanted to go to Faridabad in the first place! I have no interest in attending the wedding. You forced me to come along.” Aarushi isstern;her voice has a renewed sense of purpose. Gayatri is dumb-founded. Suddenly, this Jaipur airport to Faridabad taxi ride seemed never ending to her. She wishes she could go back in time and put Aarushi’s weed back where she found it.‘But how could she have known…Does that even matter’ a voice in her head replies. “Yeah, I do” Gayatri replied, meekly. She couldn’t bring herself to say anything. The reached their destination, Gayatri held on to the same purse, took out the money and paid the cab fare. The two never spoke about the incident again. Gayatri is still cheating on her husband. Aarushi never gave up the habit. But for Ajeet, that oneJaipur airport to Faridabad taxi service he delivered changed his life. Ever since then, he quit smoking and spent more quality time with his daughter. All my life, I have been a scared person. Scared of my wife’s anger, scared of our children’s demands, scared of the neighbour who always parks in my spot. This is the story of the bravest moment of my life. “We have suffered enough! Starting today, I pledge my unconditional support to our cause.” roared Mr. Smith, amid hoots and claps from his supporters. Mr. Smith’s oratory charm was such that he could say anything he wanted, and get away with it. Even I, someone who considered himself as being above the divisiveness of religions, admired his thoughts & actions. I wanted to listen to the speech further but I had to change the channel as I drove into an elongated driveway (Passengers do not like nosy drivers you see). However, I still couldn’t get over the fact that my would-be passenger had crores of followers’ world over & was probably one of the most famous & respected figures of his religion. I turned off the radio as I parked the Jaipur to Faridabad airport carright in front of his wide doorway, took a deep breath and reminded myself to keep calm. Even though he was a celebrated figure, I had to think of Mr. Smith as just another passenger wanting to make his way to Faridabad airport. “You have to do it Sagar, stop acting like a wuss, and he is just a man” my reporting manager had reminded me the day before. I dropped my manager a message saying I had reached Mr. Smith’s house. I also texted Mr. Smith, informing him about my arrival. Normally riders with a celebrity status are not ready at the time they specify, but not Mr. Smith. He walked out of his home exactly three minutes after I sent the message. In first glance, he seemed to look more like a young politician, from his slickly pushed back hairdo down to his blue Hawaii chappals. A clean-shaven man wearing a white Kurta over a pair of jeans is rarely thought of as a religious leader. But that was Mr. Smith for you. Other than his punctuality and clothing choice, his etiquette seemed to be that of a humble man. I wanted to put his luggage in the cab’s boot, he politely denied the offer. I was beginning to understand why so many people admire the magnanimous Mr. Smith. “Chalein sir?” he asked, smiling politely. “Ji sir” I replied, as I opened the backseat gate to let him in. It took us half an hour to reach the Jaipur to Faridabad Highway by cab. As we crossed the Jaipur toll booth, I heaved a sigh of relief. This ride was going smoother than I had anticipated. My relief was short-lived. I felt cold hard metal being pressed up against the back of my head. I looked in the cab’s rear-view mirror. Mr. Smith had a pistol in his hand, and it was pointed straight at me. “Whatever you do, just don’t stop the cab”, Mr. Smith said, again smiling ever so politely. Mr. Smith looked calm as ever. When I decided to take this Jaipur to Faridabad airport drop I was hoping to get a nice guy like you. He reached inside his Kurta’s right pocket and took out a packet of Marlboro. Offered me one & took one for himself. From the same pocket, he took out a gold-plated lighter, lit up his cigarette &then mine. As I took a puff, a strange thought occurred. ‘Maybe this is some kind of TV prank.’ I began to tell myself that this is the case. That I am stuck in reality-show. “You know, I have never smoked while having a gun pointed towards me, feels like I am in a movie” I said. ‘Okay, this is definitely not a TV prank’ I thought. My heart beginning to pound. I put both my hands on the steering wheel. Why did he want to take a picture on my phone? Maybe he was a sadist. I did not think too much and opened the car’s dashboard, shuffled around for my phone & gave it to him. I turned the volume up. So here I was, Sagar Sharma, a simple hard-working driver stuck in a cab with a crazy religious loon. I knew for sure that Mr. Smith was a psychopath, not because he had pulled a gun on me or threatened to kill my family. He was crazy because of the extremely calm conduct he maintained during the entire conversation. But I didn’t get it? What did he want? Why was he doing this? Was he going to kill me at the end? “I have a question I would like to ask if you allow?” I asked, hopefully. “Yes, sure. Go ahead” he was smiling as usual. “You are a man who is followed by so many people, of all religions alike. Nearly everyone respects you? What will you get from killing a driver?” I just wanted him to say that he isn’t going to kill me. “Don’t worry, I am not going to kill you, you’re just an unwitting member of the larger plan?” I felt relieved & nervous at the same time. What plan was he talking about? “You know what I don’t care who has wronged you. Can you please just let me go?” He clearly did not want to tell his ‘Grand’ plan. I decided to beg for my freedom instead. “I can’t let you go”, he said. Before picking him up, I had seen, read & heard all of Mr. Smith’s interviews & speeches. That is why I couldn’t understand the reason behind his actions. He had always proposed non-violence & inclusiveness as the best features of a progressive society. His charitable work included people from all religions. Then why now? Why would change his ideology? Why couldn’t he just let me go! And then it started making sense. Josie Millett was a 10-year-old Christian girl who had been killed in a bullying incident a week back. The incident had created uproar in the Christian community as the children bullying her were Hindu. Mr. Smith was possibly behind some sort of symbolic revenge on Hindus, as retribution towards the killing of Josie. But all this neurotic investigation was just a theory; I thought that I should confirm this theory. I turned around to face Mr. Smith; he lowered his gun’s nozzle. “SMART BOY!” his normally calm face expressed amazement. His expression went back to being calm & composed. Mr. Smith went completely silent, leaving me to my own devices. I did not want to be another ‘Collateral loss of life’! But what could I do? A single move and he would shoot me. I began evaluating options. I could simply crash the car, but then both of us could die, I could hit the brakes, but he might still be able shoot me. No matter what solution I considered, nothing seemed to end with me living. I saw a truck approaching us in the right rear-view mirror. Honking loudly, coming up fast. I still remember the thought I had in my mind at that moment. ‘If I do this, at least I go on my own terms’. It has been six long months since I crashed the Hippocab into that truck. I was in a coma for five months after the crash. Mr. Smith’s true intentions are still a mystery to me. Some cops did visit me the day I woke up. They told me that Mr. Smith’s luggage was found full of country-made rifles & pistols, he had probably planned a mass shooting. They did not tell me his exact plan, but they did say that he was given a state funeral & the events which occurred in that Hippocab have not been shared with the public. One of the cops said that stories like these could begin riots; he said that Mr. Smith had been an excellent citizen for most of his life, so they decided to let him be remembered as one. They thanked me for my bravery & warned me to not tell anyone about the events which transpired on the highway. I disagree and so I decided to tell you this story instead. I don’t care about their ‘warnings’, I have had a gun to my head before. On a personal note, I am still scared of my wife’s anger & my children’s demands. But my neighbour dares not park in my spot when I get back! Jaipur to Faridabad Etios 9 INR/Kms. Jaipur to Faridabad Dzire 9 INR/Kms. Jaipur to Faridabad Amaze 9 INR/Kms. Jaipur to Faridabad Accent 9 INR/Kms. Jaipur to Faridabad Innova 12 INR/Kms. Jaipur to Faridabad Xylo 12 INR/Kms. Jaipur to Faridabad Lodgy 12 INR/Kms. Jaipur to Faridabad Bus 224 Kms. 6 Hrs. Jaipur to Faridabad Cab 224 Kms. 4 Hrs. Jaipur to Faridabad Train 224 Kms. 4 Hrs. Select from addresses below or enter your address above. Updated price for your selected location would be Rs. Extra Charges after kms= Rs. /hrs. Kms will be billed from garage to garage. Minimum km charged per day for this trip: km. This fare does not include inter-state tax, toll and parking. Unfortunately HippoCabs does not provide their services on this route but there are a lot of other travel agents who do. We have just sent you their details via SMS. Thank you for sharing your details with other travel agents. You can expect a call back from them shortly or you can call them on your own. We've sent an SMS with OTP to . It may take a while! Dont have an account? click here to Sign up. By signing up I agree to all terms and conditions.